Were you searching for Barbecue Grill Mats that are used on the grates of the barbecue grill to protect them and to keep food from falling into the flames? Like the black mat pictured on the left? 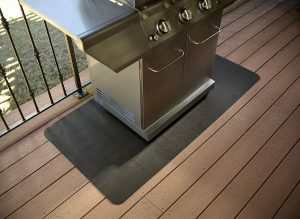 If this is what you’re looking for, click on the image, and you will be transferred to the page that reviews that type of bbq grill mats.
. . . or were you searching for the type of Grill Mats that fit under the barbecue unit like a rug and protect your deck or patio from splatters like the one shown in the image to the left? If so then read on because you came to the right place! It’s great idea to use a grill mat or splatter mat to protect your deck or patio. After all, it’s very difficult to remove grease spots from those surfaces, and considering the relatively low cost involved for a Splatter Mat, it’s wise purchase to make. Their a quite a few options available that vary in price, size and a few other features. The first thing to decide is how “heavy-duty” your splatter mat needs to be. This will be dependent on much grilling you do. 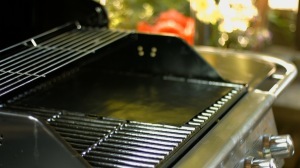 If you grill daily, for example, you’ll need a heavy-duty mat. If you grill a couple of times per season a light-duty mat will suffice. How Does a Splatter Mat Work? Many of the absorbent material Splatter Mats available on the market are also reversible, so that if one side starts to look a bit unpresentable you can flip it over and use the other side. How Big is a Splatter Mat? Splatter Mats come in varying sizes that range from 30 x 40 up to 40 x 60 and pretty much everything in between. Let’s take a closer a look at some of the better options out there. The pad is flexible, and is constructed from two fiber materials separated by a “patented barrier media” that prevents the drips from seeping through to the other side. What this means to the user is a truly reversible mat, as the oil and grease on the used side will not soak through to the opposite surface. Some buyers will be attracted to the fact that these mats are made with 100% recyclable materials, a feature that sets them apart from most other mats on the market in that one regard. You can read more on the Amazon Product Page if interested. This is a different style of mat from the splatter mat described above, but they both serve the same purpose. However this mat isn’t designed to soak up the grease – instead it is grease resistant and, according to the manufacturer, it is also easy to wipe clean. It’s flame and oil resistant, and features a rubber backing which will keep it from blowing away or sliding. It has a diamond plate finish and can roll up for easy winter storage. In my opinion this is an ideal mat for concrete surfaces but the rubber backing could leave marks on natural wood or composite. It’s also a great mat for multi-purpose applications and would work well in a shop or garage workspace. Click on the image for more information or to purchase. The DiversiTech comes with a 10-year warranty which makes it a standout in terms of the company customer support. It also has the highest level of temperature protection of any splatter mat that I’ve seen, withstanding temperatures up to 600 degrees Fahrenheit. You can use this mat on wood, tile, slate, brick, stone and concrete and it will function well under all types of grills and even under fire pits. Even in harsh conditions The DiversiTech Ultra Grill Mat is flexible and won’t tear, curl up on the edges or crack from heat exposure – it’s guaranteed. According to the manufacturer, “The DiversiTech ULTRA Grill Mat sets a new standard for surface protection unrivaled by any product on the market and targets the outdoor enthusiast who demands the best possible protection.” Click on the image for more information or to purchase.